Honor is expected to unveil new smartphones on June 6, adding to its burgeoning lineup. 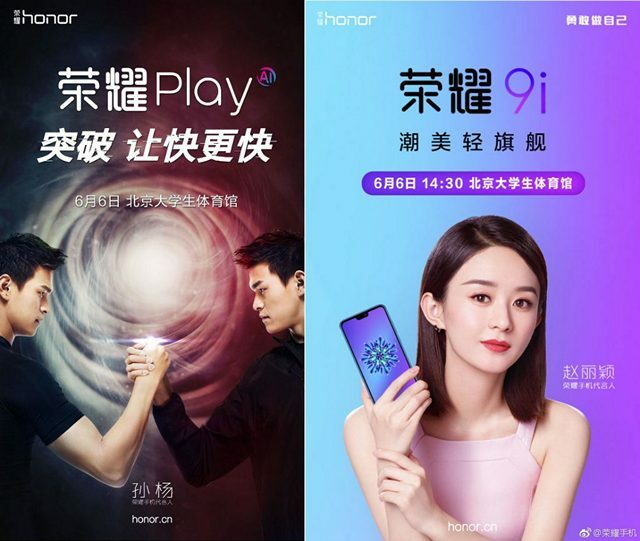 In fact, the company is reportedly all set to announce a whole new series – Honor Play – that will look to leverage AI (artificial intelligence) for some of its features as seen in the teaser poster. Huawei is also teasing a ‘breakthrough technology’ that it says will be introduced with the new Honor Play Series smartphone(s). Huawei will also launch an Honor 9i smartphone that will apparently be distinct from the Honor 9i that was released in India last year. The two phones were also certified recently on TENAA with the Honor 9i (2018) expected to have a 5.84-inch Full HD+ 2.5D display with a 19:9 aspect ratio, which means, it will very likely be the next Android handset with a notch. It will be powered by the Kirin 659 SoC that comes with an integrated 64-bit octa-core Cortex-A53 CPU and a MaliT830-MP2 GPU. The device will reportedly come with 4GB of RAM, and will be offered in 64GB, 128GB and 256GB storage options. It will apparently carry a 3,000mAh battery, and run Android 8.0 Oreo with EMUI 8.0 on top. It will also apparently feature a hybrid Dual-SIM slot, a fingerprint scanner, a 3.5mm audio AUX port, FM radio, 4G VoLTE, WiFi 802.11 b/g/n, Bluetooth 4.2, GPS and GLONASS. Imaging duties on the rumored Honor 9i (2018) will be taken care of by a rear-facing dual-camera setup that includes a 13MP primary sensor and a 2MP secondary sensor. The front-facing module, meanwhile, is a 16MP unit. The Honor 9i is expected to come in at least three color options, including Black, Gray and Blue.